The adorable Carrie from Brick City Love just awarded me my VERY FIRST blog award, the 'Honest Scrap' award! This award is bestowed upon a fellow blogger whose blog content or design is, in the giver’s opinion, brilliant. Wow, me? Neato! When accepting this award, you must write a post bragging about it, including the name of the person who thinks you deserve such acclaim, and link back to the said person so everyone knows she/he is real. Done and done. Choose a minimum of seven blogs that you find brilliant in content or design. Or improvise by including bloggers who have no idea who you are because you don’t have seven friends (that would be me). 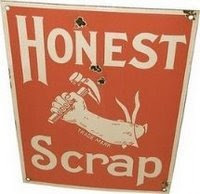 Show the blog names and links and leave a comment informing them that they were prized with the Honest Scrap award. List at least ten honest things about yourself. Then pass it on! 1. My license plates say LUVBUFF because when I got my car I was obsessed with Buffy the Vampire Slayer. In related news, congrats to SMG and Freddy Prinze Jr. on their new baby friend! 2. I hate the way I painted/decorated two rooms that I rushed to finish less than a year ago. Do. Not. Rush. 3. I already need to replace my 5-year-old mattress and boxspring because me and my dad accidentally let both (brand new) pieces fly out of his truck onto the busy freeway on the ride home - the mattress was lumpy and ruined from the get-go. Just enjoy that mental picture, ok? And if any of you have mattress suggestions, I'm all ears! 4. I am obsessed with chocolate brown (and chocolate in general), I have it in the decor of pretty much every room in our house. 5. I am a 'lazy' vegetarian, which means I eat a lot of cereal, cheese pizza and prepackaged foods like Morningstar and Boca. But not, uh, vegetables. 6. I play the piano, but have not gotten the poor thing tuned in years....so it is un-playable and is currently holding up candles and mirrors in my dining room. For SHAME. 7. The best vacuum I've ever owned is a big metal Kirby that was manufactured the year I was born (1979). This silly young dude gave it away for $25 bucks on Craigslist. Sucka! 8. I don't want to plan my wedding because I hate 'bride' stuff...and I'm cheap. There, I said it. 9. I want my kitchen done incredibly bad, but I'm too scared to start it. 10. I haven't photographed the master bedroom yet because I'm obsessing over finding the perfect bed pillows. Yeah, it sounds as stupid typed out as it does in my head. 11. Half of the windows in our house are still painted shut, and we broke the two windows in the living room right after we moved in but haven't replaced them yet. For SHAME. Mabel's House - what an incredible writer! Totally hilarious mix of posts. Freckles Chick - cute, funny, beautifully decorated home. The Brick House - awesome style beat the pants off the 'weird baby in the bathroom' in the Rejuvenation contest. Yes, I voted! Centsational Girl- just too crafty for words, her projects keep me motivated! Just Beachy - the 'queen of beautiful molding' never disappoints, and is supportive to a new blogger as well. Nuestra Vida Dulce - stunning room makeovers abound. Seriously. Jeremy and Kathleen - this blog makes me want to have my wedding at home SO BAD. Lovely! For those of you that I have never talked to before, hi! I'm Sara, and I happily stalk your blog on a daily basis. Thanks for inspiring me every day! Hi Sara. Thank you for the award, you're such a sweet heart! Yes thank you so much Sara you are so kind as well . Awww, so thankful. Blushing here. You are too kind. Hey look, I'm follower #2. Someday when you're famous, I'll say, "I knew that gal way back when". I am so glad I am not the only 'engaged' girl who would much rather shop for 'kitchen cabinets' than a dress! And it's actually held guests!